So for now, we all have to treat each other with equal suspicion in what is yet another paragraph taken from George Orwell's novel, 1984, just in case…. 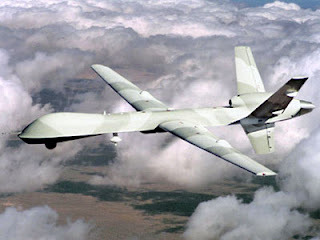 I heard on the BBC news this morning that Kent Police want to use BAE systems 'drones' – rather like the 'Predator' in Afghanistan but without the impressive weaponry' – for a range of different tasks which include traffic policing. Forgetting the enormous expense for one moment, I've a personal objection to unmanned aircraft buzzing around the world's busiest airspace. Last summer I was prevented from flying a banner over one of the V-Festivals in the north of England by the police and subsequently discovered the reason, that they were testing an unmanned drone, sitting over the stage at 2000 feet, watching and photographing the crowds. While I'm sure that the intelligence these systems offers can be extremely useful, the Kingsnorth power station demonstration would be an excellent example, I worry that the system would be abused; isn't it always, and the costs would detract from the investment to police communities properly, which is what people really want rather than 'RoboCop'. Unfortunately, with 2012 and the Olympics fast approaching, I can promise you that RoboCop and much more is what we are going to get as the authorities become increasing paranoid and security conscious in the period between now and the games. But when the Olympics are over, the security infrastructure will remain in place and like proliferating CCTV, is most unlikely to be dismantled, ever.